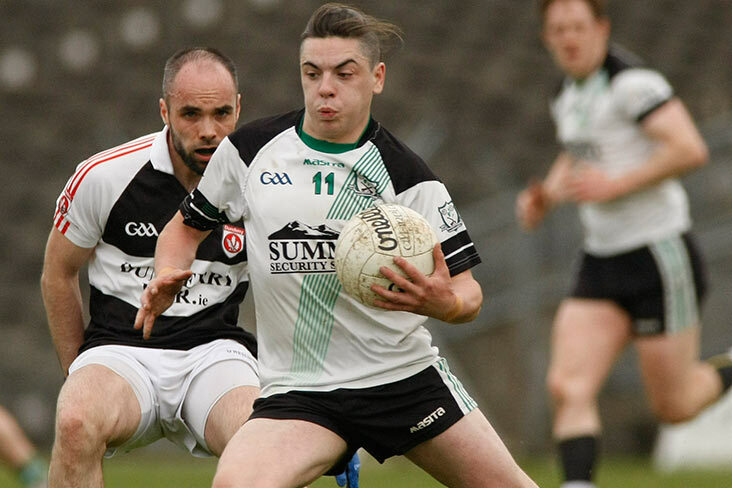 Longwood's footballers served notice that they are a force to be reckoned with in this year's IFC with a strong performance against hitherto unbeaten Meath Hill this afternoon in Páirc Tailteann. Meath Hill entered the game on a high having secured the Division 3 League title the previous weekend. However, Longwood were in no mood to bow down to their opponents and produced a clinical and controlled performance, getting on top early and maintaining their dominance throughout the contest. Longwood settled quickly and were three points ahead after just 8 minutes after early scores from Ryan Moore (2) and Aaron Ennis, both of whom would continue to torment the opposition for the remainder of the afternoon. Meath Hill responded with their opening point after 10 minutes before further points from Moore and Evan Coyle extended the advantage to 4 points. Another Meath Hill point from play proved to be a false dawn as Longwood's forwards took over with a run of 6 successive points from Anthony Healy (2), Ryan Moore, Mickey Burke, Eoin Lynch and Evan Coyle. Entering the second half with 9 point cushion, Longwood could have been forgiven for adopting a more defensive approach to close out the game. Instead they looked to press home their advantage at every opportunity. Both teams exchanged early points in the opening minutes before Longwood suffered a setback losing Chris Lynch to injury with 25 minutes still to play. His replacement, Coran Byrne, slotted in seamlessly and maintained a tight leash on his direct opponent. Midway through the second half, Aaron Ennis hit his own personal purple patch as the ace corner-forward netted 1-2 in just seven minutes, the goal being a fantastic solo effort where he took possession of the ball near the sideline, took on and beat his marker before unleashing a rocket to the back of the net. This fantastic score brought the Longwood supporters to their feet and put the finishing touch to what was Longwood's best championship performance in some time. The only real concern came towards the end when Damien Healy was forced off the field after a nasty clash of heads. We hope that Damien will recover quickly. Huge credit to all the players for a fantastic performance. The management team deserve a special mention as they got all their match-ups spot on, particularly in the full back line where Paul Gill, Chris Lynch and Damien Healy snuffed out the considerable threat provided by Meath Hill's potent full forward line. Longwood: Gary Heneghan; Paul Gill, Damien Healy, Chris Lynch; Bob Maguire, Joey Stenson, Karl Ennis; Niall Mulvey, Eoin Lynch (0-1); Ryan Moore (0-8), Sean Sheridan, Evan Coyle (0-2); Aaron Ennis (1-3), Mickey Burke (0-1), Anthony Healy (0-3). Subs: Wayne Leonard (0-1), Coran Byrne, Ross Kerrigan, Johnny Furey, David Rowley. As has become the norm over the past month, Longwood switch codes yet again next weekend when they tackle Blackhall Gaels in Round 5 of the Senior Hurling Championship. The fact that the boys have performed consistently well in both championships on alternate weekends is a testament to their fitness, dedication and incredible skill. Our local heroes continue to give fantastic service and vaue to the community and we encourage everybody to come out and support the boys next Saturday evening.